In addition to the dozens of fun and fabulous attraction ride vehicles you’ll encounter during a Walt Disney World vacation (Hunny Pots! Doom Buggies! ), you’re also likely to go on some plain and practical rides during your visit. These are the many types of transportation vehicles that do yeoman’s work getting you from point A to point B on the 40 square miles of Disney property. Here’s a primer on the types of transport you’ll find on your trip. 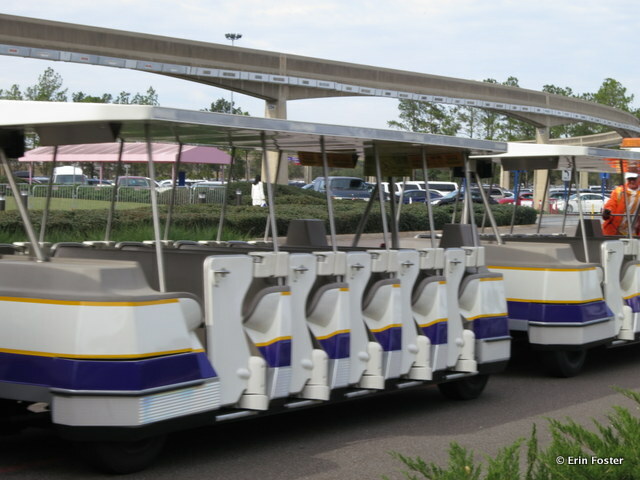 You may use many forms of internal transportation during your visit to Walt Disney World. Disney’s Magical Express bus service has its own rules, but all of the other forms of transportation listed below can be used by anyone, any time, for free. Again, except for Magical Express, transportation use has no requirement that you be staying on property or at a particular resort. You don’t have to have any sort of ticket to use these transportation vehicles. The drivers don’t have any mechanism to take payments or tickets or anything like that. Really, it’s free. 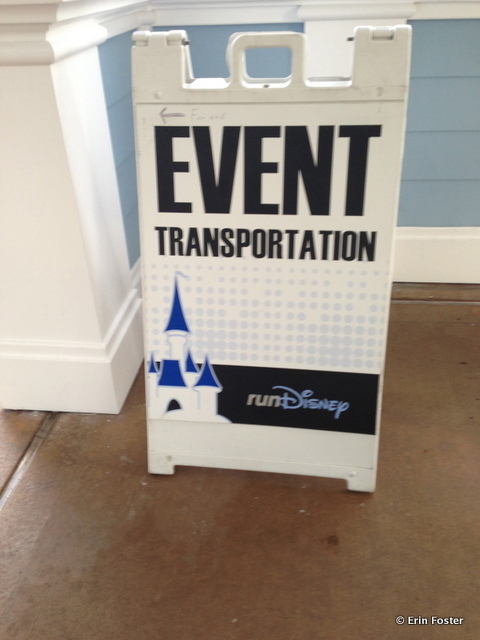 You may very rarely see some fine print that some transportation is only for resort guests. In 15 years of frequent WDW visits, taking thousands of trips on Disney internal transportation, I have never been asked where I’m staying as a condition of boarding a vehicle. On the three to five most crowded days of the year, you might be asked to show resort ID to get on the monorail to the Magic Kingdom, at some times of the day. This is simply for crowd control purposes at the park and has nothing to do with limiting your access to the transportation itself. 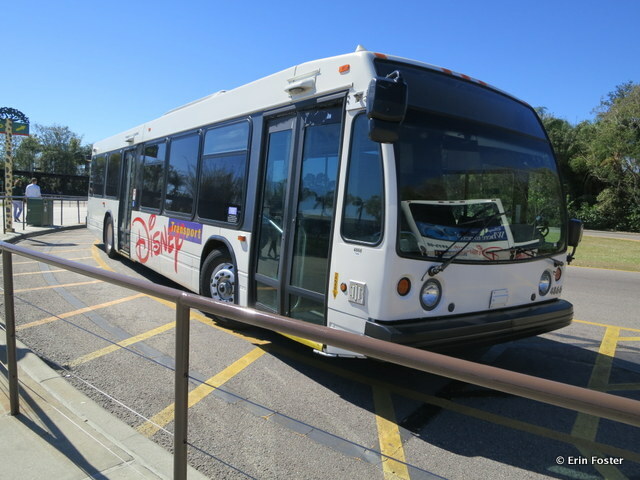 You can get anywhere on Walt Disney World property using only this free Disney-provided transportation, but bear in mind that many types of trips will require a mid-route transfer. 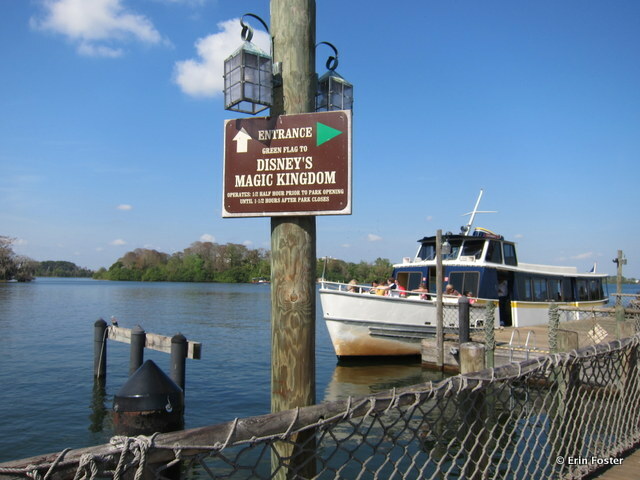 For example, to get from the Magic Kingdom to Epcot, you’ll need to change monorail lines at the Transportation and Ticket Center, or to get from the Animal Kingdom Lodge to the Beach Club, you’ll need to change buses at the Animal Kingdom park or switch from a bus to a boat at Disney’s Hollywood Studios. Where Does This Operate? : There are three monorail lines. The Express Monorail runs a continuous loop between the Transportation and Ticket Center (Magic Kingdom parking) and the Magic Kingdom. 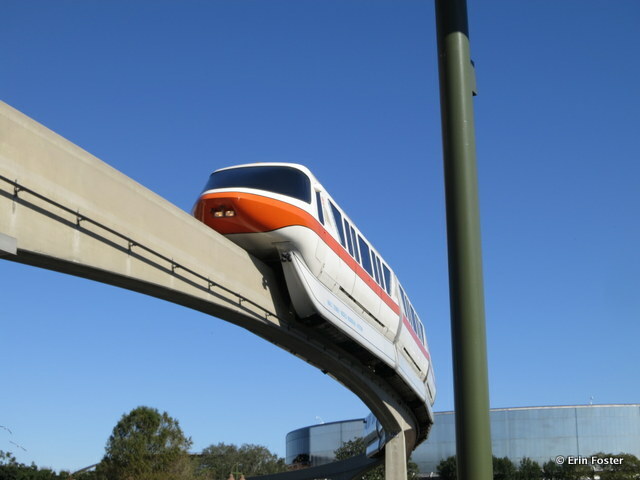 The Resort Monorail runs a continuous loop from the Transportation and Ticket Center to the Polynesian resort, the Grand Floridian resort, the Magic Kingdom, and the Contemporary resort, in that order. The Epcot Monorail runs back and forth between the Transportation and Ticket Center and Epcot. What Are the Hours? : This varies and changes with some regularity. In general, expect the monorail to run at a minimum from one hour before park open to one hour after park close. The resort line monorail often, but not always, starts moving guests at 6:30 a.m. to accommodate folks with 7:00 a.m. breakfast reservations at Chef Mickey’s in the Contemporary. 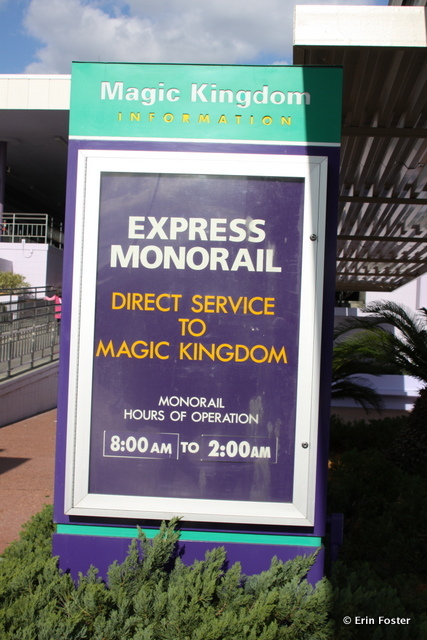 Recently, monorail service has stopped running early during events such as Mickey’s Not So Scary Halloween Party or Mickey’s Very Merry Christmas Party. If this is the case, or if the monorail temporarily suspends operations for technical reasons, then bus service will be provided as an alternative. How Often Does This Run? : There is no set schedule, but generally you can expect the next monorail to arrive within four to seven minutes. What Is the Seating Like? : Monorail cars have minimal bench-style seating. First thing in the morning, last thing at night, and during crowded times of the year, it’s likely that you may have to stand. Is this Wheelchair/ECV Accessible? : Yes. The monorails are fully wheelchair and ECV accessible. The monorail cast will set up a ramp allowing guests with mobility devices to roll right on. What Happens with Strollers? : The vast majority of the time, guests will be able to roll strollers directly onto the monorail, either with or without children in them. There is no need to wake a stroller sleeping child to ride the monorail. 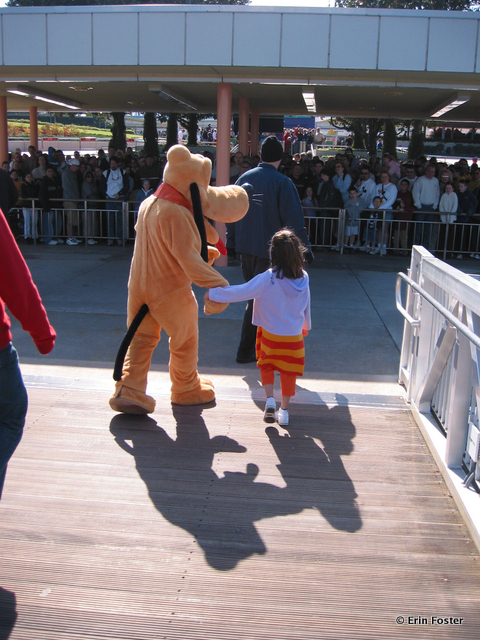 Only rarely, during the most crowded conditions, a cast member may ask you to fold a stroller to better accommodate more guests on board. If you’d like to avoid this, you can simply wait until the crowds dissipate. Are There Alternatives to Using This Form of Transportation? : Yes. To get from the Ticket and Transportation Center to Epcot, you could take your own car or possibly a bus. 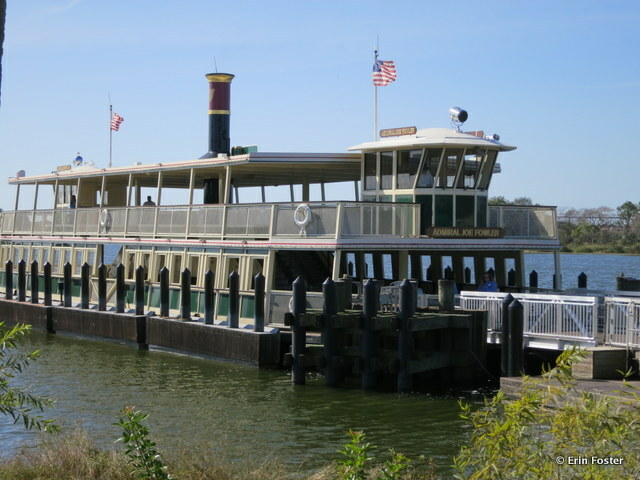 To get from the TTC to the Magic Kingdom, you could take the ferry. To get between the Magic Kingdom area resorts, you could take your own car. Any Additional Tips? : Guests are no longer allowed to ride in the front car with the driver. The monorail, your highway in the sky. 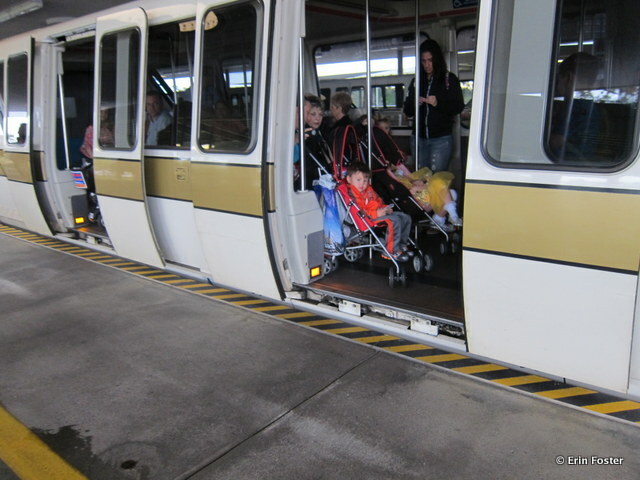 Children can stay in strollers while on board the monorail. Typical operational hours Christmas week. Typical operational hours in late spring. Where Does This Operate? : Trams take guests from the park entrances into the far reaches of the parking lots at the Animal Kingdom, Epoct, and Disney’s Hollywood Studios. There are no trams directly at the gates of the Magic Kingdom. Guest who have driven their own cars to the Magic Kingdom will find trams that go from the Transportation and Ticket Center to the parking lot. What Are the Hours? : Generally, the trams run from one hour before park opening to one hour after park closing. How Often Does This Run? : There is no set schedule. Trams generally come every five minutes at park closing time. During the day, they run less frequently, perhaps every 15 minutes. If your car is not too far out, it may be faster to walk. What Is the Seating Like? : There is a large step up onto bench style seating. Is this Wheelchair/ECV Accessible? : Folded wheelchairs might be accommodated in the first row of each tram car. Guest riding in wheelchairs or ECVs may not board. What Happens with Strollers? : Strollers must be folded and carried onto the tram. Are There Alternatives to Using This Form of Transportation? : Yes. You can walk to your car rather than taking the tram. Guests in wheelchairs or ECVs will likely be parked in the handicapped spots closest to the park gates, making this walk minimal. Any Additional Tips? : Successful tram use is dependent on knowing where you parked your car. PLEASE make note of your lot name and row number so you know where to exit the tram when the time comes. Tram loading area at the Animal Kingdom. The back of a tram vehicle. There is more than one tram route at the Transportation and Ticket Center. Make note of your location. Where Does This Operate? 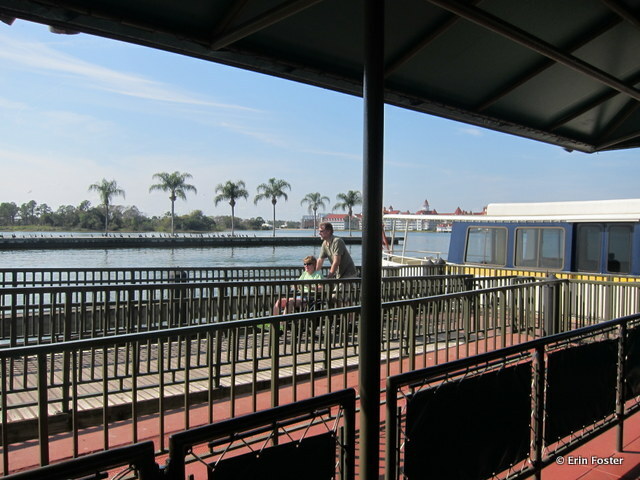 : The ferry runs between the Transportation and Ticket Center and the Magic Kingdom. What Are the Hours? : Hours vary seasonally. Generally you can expect the ferry to run from about one hour prior to park opening to about one hour after park closing. How Often Does This Run? : There is no set schedule. Typically, ferries arrive every 15-20 minutes. What Is the Seating Like? : There are two levels of bench seating. Guests must take stairs to get to the second level. Seating availability is somewhat limited. During crowded times, you may have to stand. Is this Wheelchair/ECV Accessible? : Yes. Wheelchairs and ECVs can roll on board via a ramp. What Happens with Strollers? : Strollers can roll on board. There is no need to remove the child. Are There Alternatives to Using This Form of Transportation? : Yes. You can take the monorail instead. Any Additional Tips? : Ferry use may be suspended during adverse weather conditions. Ferry waiting to load guests at the Magic Kingdom. Ramp from the ferry to the TTC. On rare occasion, you might find characters on board the ferry. Ferry loading area at the Transportation and Ticket Center. Where Does This Operate? : Almost everywhere. Buses are the only form of transportation to/from the Animal Kingdom, water parks, value resorts, and Downtown Disney. Buses serve some locations to/from all the other resorts and theme parks. What Are the Hours? : Hours vary seasonally. Generally you can expect the buses to begin running to a theme park about one hour prior to park opening and continue until about one hour after park closing. Buses run from Downtown Disney to the resorts until at least 1:00 a.m.
How Often Does This Run? : The standard line is that Disney buses run about every 20 minutes. In practice, this could be a often as every five minutes or as infrequently as every 30 minutes, depending on the time of day and crowd levels at Walt Disney World. If it seems like an inordinate amount of time is elapsing between buses, ask a cast member to inquire about problems on the route. What Is the Seating Like? : The primary Disney transport buses are like standard city buses. They have hard, molded plastic seats. During crowded times, the buses fill to capacity and riders may be required to stand. Is this Wheelchair/ECV Accessible? : Yes. 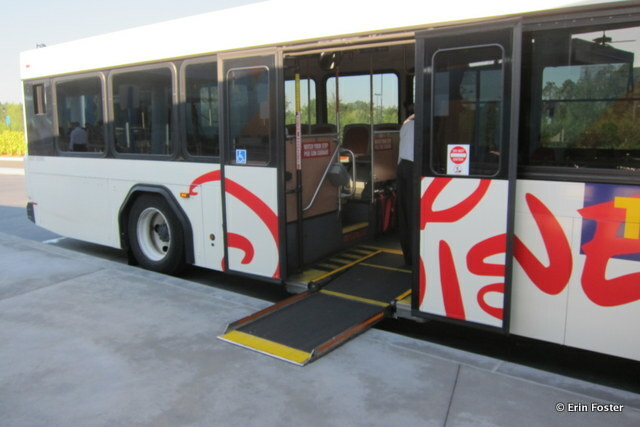 All Disney transport buses are capable of transporting wheelchairs and ECVs via a ramp/lift. What Happens with Strollers? : Stroller must be folded and carried onto the bus. Are There Alternatives to Using This Form of Transportation? : In many cases, no. For most bus routes, your only alternative would be driving your own car. Any Additional Tips? 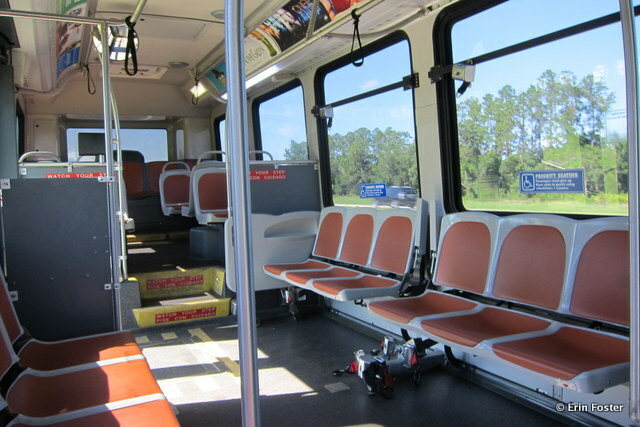 : Car seats are neither required nor accepted on the Disney buses. If this is an important issue for you, renting a car with a car seat is the best alternative for you. Ramp extended for ECV and wheelchair guests. ECV secured on board a bus. 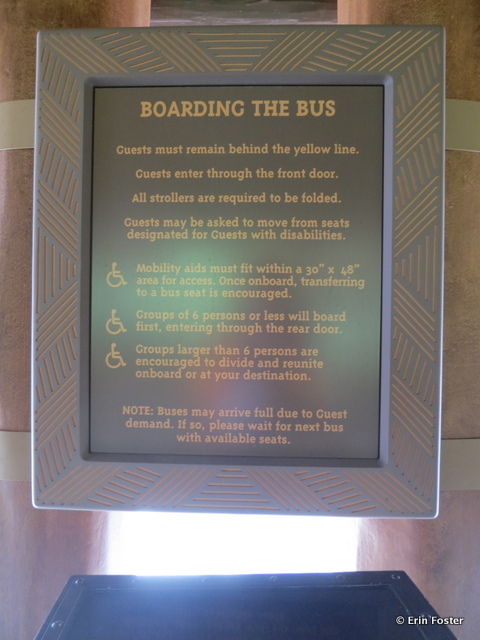 Guests with walkers, or who have other mobility issues involving stairs, may be able to use the lift/ramp to board the bus. Strollers must be folded and carried onto the buses. 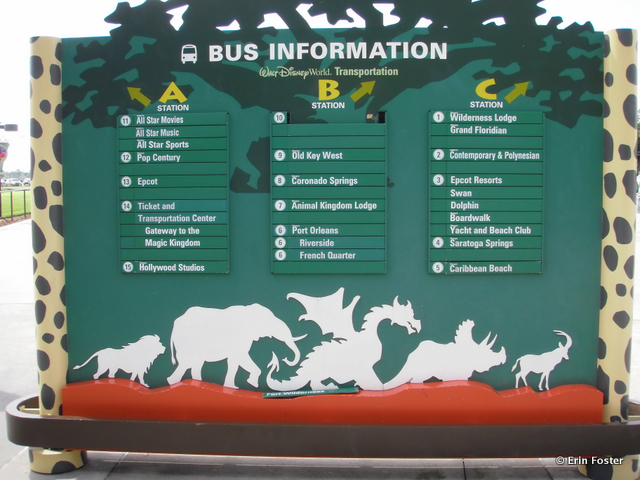 At the theme parks, use the signage to help you find the bus headed to your destination. Buses will be added for special events such as RunDisney races. Where Does This Operate? : Friendship boats run a loop which includes Disney’s Hollywood Studios, the Swan, Dolphin, Boardwalk, Yacht and Beach Club resorts, and Epcot. 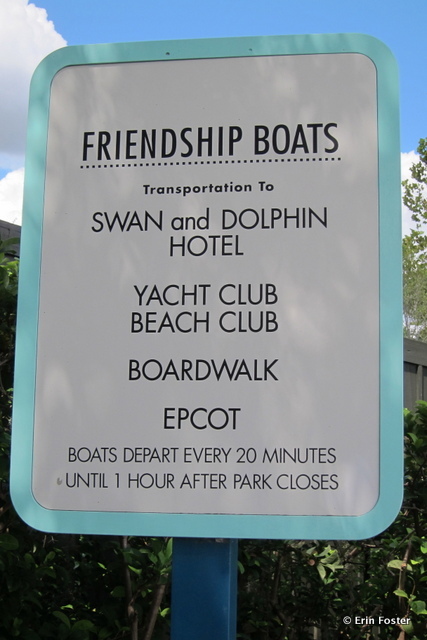 The Friendship boats are the only vehicles serving DHS and Epcot from these resorts. (There are no buses to these locations.) 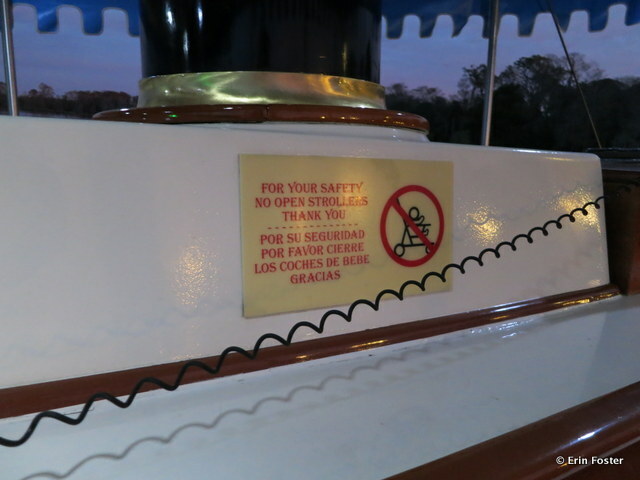 There are also Friendship boats inside Epcot, servicing the World Showcase area. What Are the Hours? : Hours vary seasonally. Generally you can expect the boats to begin running to a theme park about one hour prior to park opening and continue until about one hour after park closing. How Often Does This Run? : The Friendship boats run approximately every 15-20 minutes. What Is the Seating Like? : Bench seating mostly indoors, but with some seats outside. Is this Wheelchair/ECV Accessible? : Generally yes. However, if the water level is particularly low or there are high winds in the area, wheelchairs and EVCs may not be able to board. What Happens with Strollers? : Strollers can generally be rolled on board without being folded. Depending on the conditions, some captains may ask that children vacate strollers while they are being wheeled aboard. Are There Alternatives to Using This Form of Transportation? : The DHS/Epcot/Epcot resorts loop can be walked. Any Additional Tips? : Friendship boat service may be suspended during adverse weather conditions. If the boats cease operation for more than fifteen minutes, buses will be added to service this route. Friendship boat passing the Swan and Dolphin. Where Does This Operate? : There are two routes. One serves a loop between Downtown Disney, Old Key West resort, and Saratoga Springs resort. The other route serves a loop between Downtown Disney, Port Orleans Riverside, and Port Orleans French Quarter. What Are the Hours? : Service typically begins running from the resorts at approximately 10:00 a.m. and continues until approximately 11:30 p.m.
How Often Does This Run? : The water taxi boats run approximately every 20 minutes in the morning and early afternoon and approximately every 10 minutes in the later afternoon and evening. What Is the Seating Like? : Bench-style seating, fully open to the elements. Is this Wheelchair/ECV Accessible? : Wheelchairs and ECVs may generally roll aboard. This may change if water levels are particularly low. What Happens with Strollers? : Strollers can generally roll aboard. The captain may ask that children vacate strollers when boarding. Are There Alternatives to Using This Form of Transportation? : Yes. There are buses that serve these routes. Any Additional Tips? : Service may be suspended during adverse weather conditions. Water Taxis serve the Downtown Disney area resorts. Wheelchairs and ECVs may roll on board. The different water taxi routes may have different hours. 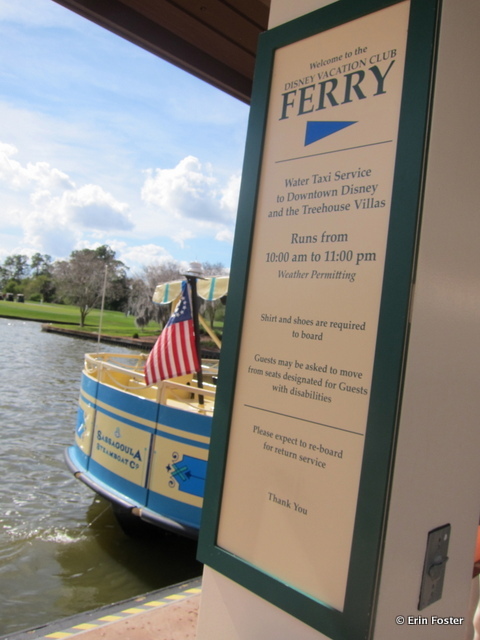 Water taxi dock at Disney's Saratoga Springs resort. Where Does This Operate? : Motor launches serve some locations in the Magic Kingdom and Magic Kingdom resorts area. Gold flag motor launches run a loop between the Magic Kingdom, the Grand Floridian, and the Polynesian. Blue flag motor launches run a loop between the Contemporary, the Wilderness Lodge and Fort Wilderness. What Are the Hours? : Gold flag launches typically run from half an hour prior to park opening to 45 minutes after park closing. Blue flag launches typically start at 6:30 a.m. and run until 11:30 p.m.
How Often Does This Run? 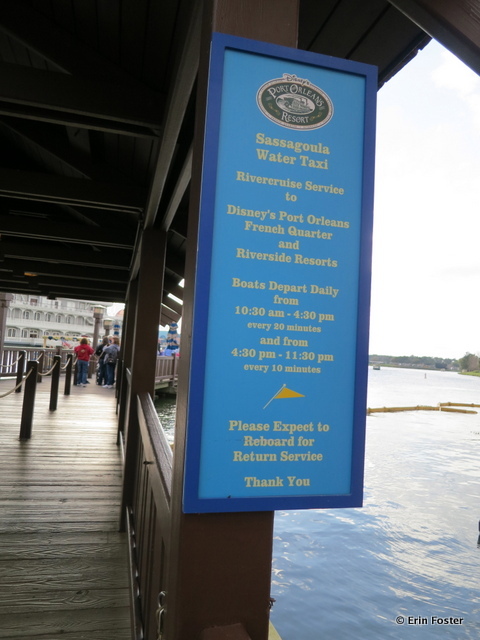 : There is no set schedule, but generally boats run every 15 to 20 minutes. What Is the Seating Like? : Wooden bench-style seats, fully open to the elements. Is this Wheelchair/ECV Accessible? : Wheelchairs may be accommodated if folded and carried on board. ECVs are not permitted. What Happens with Strollers? : Strollers must be folded to board. Are There Alternatives to Using This Form of Transportation? 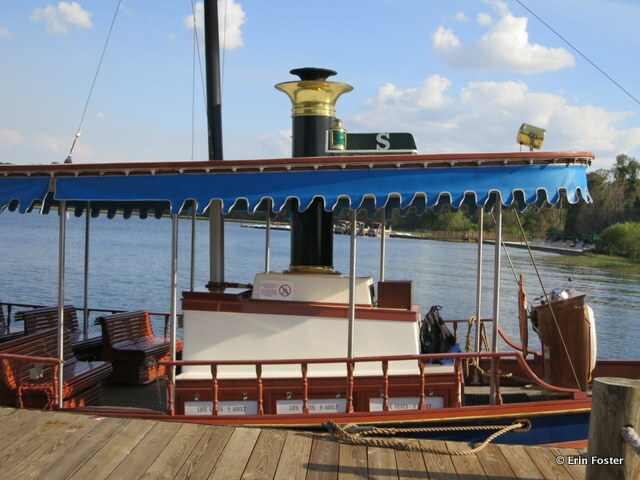 : For the gold flag locations, guests can use the monorail Polynesian and Grand Floridian. 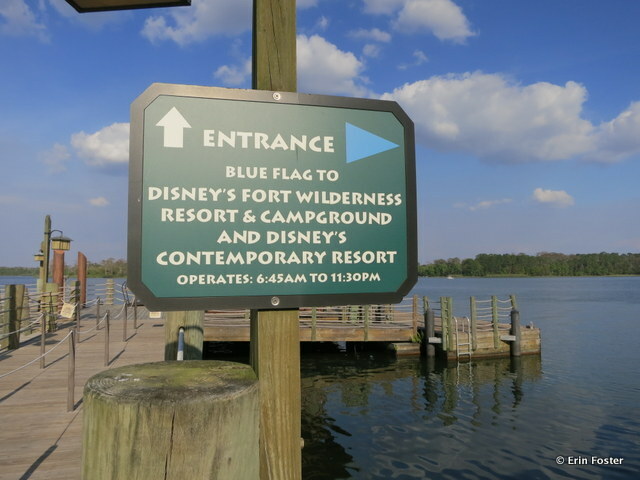 Private cars can be used to get between the Contemporary, Wilderness Lodge and Fort Wilderness, or alternatively, take a bus to the Magic Kingdom and then the monorail to the Contemporary or a bus to the WL or FW. Any Additional Tips? 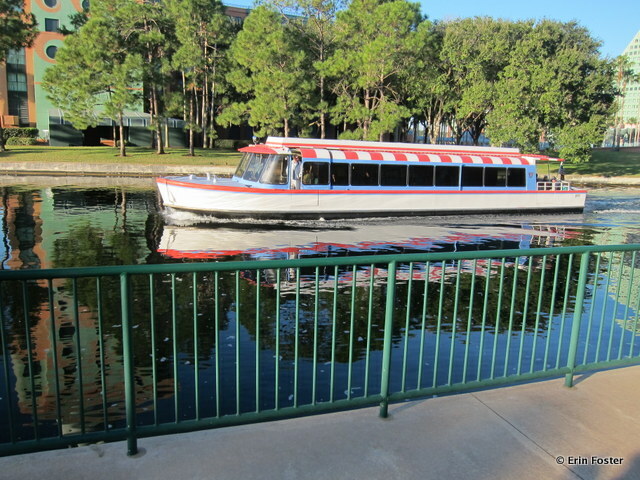 : If there is a boat waiting, this may be a faster way than the monorail to get to the Polynesian and Grand Floridian. Serve may be suspended during severe weather. 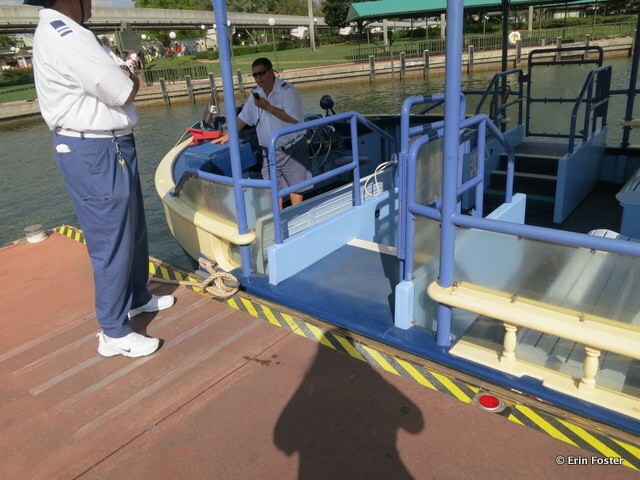 Small motor launch boats serve some of the Magic Kingdom area resorts. Motor launches are open to the elements. Not the best choice during rainy weather. 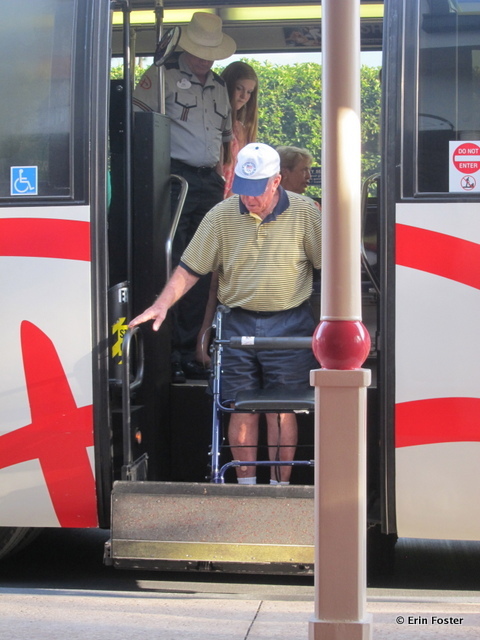 Boarding may be a challenge for guests with mobility issues. Depending on water levels, the boat may not be at the same height as the dock. Strollers must be folded on motor launches. Where Does This Operate? : Green flag motor cruisers run a loop between the Magic Kingdom and Fort Wilderness. Red flag motor cruisers run a loop between the Magic Kingdom and the Wilderness Lodge. What Are the Hours? 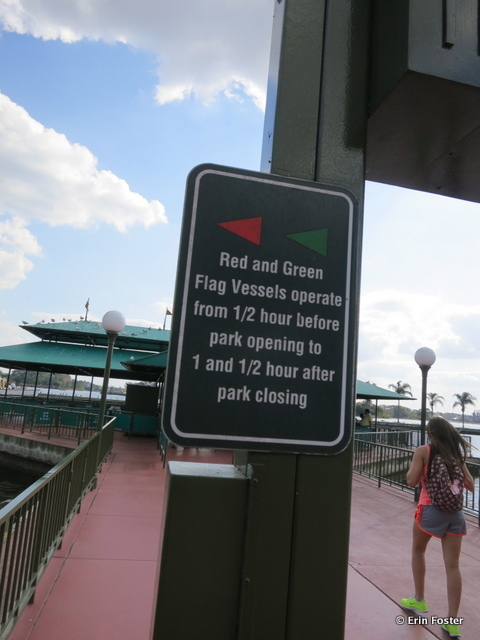 : Red and green flag routes run from 30 minutes prior to Magic Kingdom park opening to approximately one and a half hours after park closing. What Is the Seating Like? : Plastic bench-style seating. Some seats are covered inside and others are outdoors. Is this Wheelchair/ECV Accessible? : Yes, although water level issues may cause a change in this. What Happens with Strollers? : Strollers can generally be wheeled on board. Captains may ask that children vacate strollers before boarding. Are There Alternatives to Using This Form of Transportation? : Buses are available to service these routes. Any Additional Tips? : Service may be suspended during severe weather. Motor cruiser docking at the Magic Kingdom. Guest in wheelchair leaving a motor cruiser. Where Does This Operate? 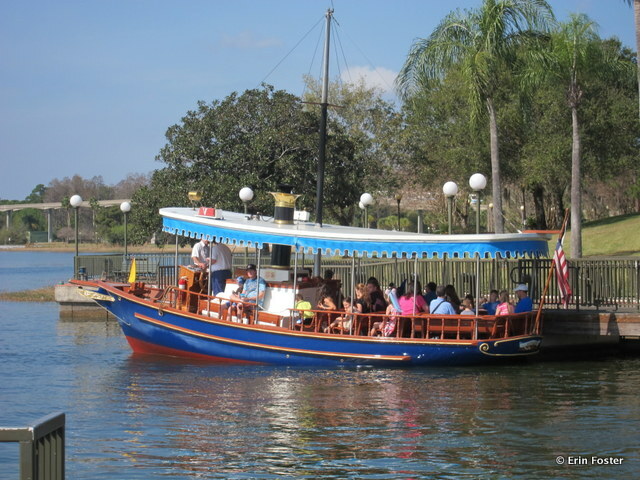 : These boats are used for the Pirates & Pals evening tour, but may be called into service during crowded days to supplement the motor cruiser routes above. The hours and schedule mirror those of route the boat is running. What Is the Seating Like? : Bench-style seating. Is this Wheelchair/ECV Accessible? : Guests must step down to enter the boat. Wheelchairs may be folded and carried aboard. ECVs are not permitted. What Happens with Strollers? : Strollers must be folded and carried aboard. Are There Alternatives to Using This Form of Transportation? : The same alternatives as listed above. Any Additional Tips? 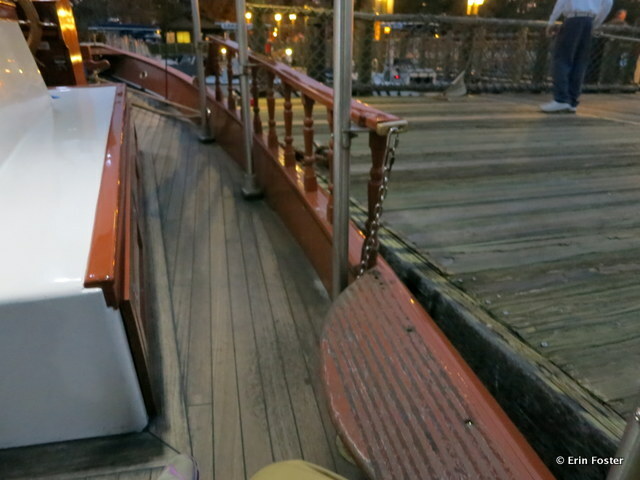 : There is a step down required to get on to the boat. 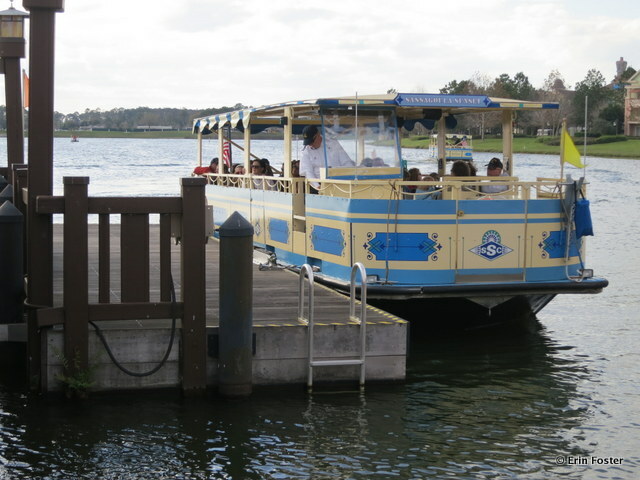 If someone in your party has mobility issues and you’ll be using water transportation in the Magic Kingdom area, it may pay to send someone ahead to see which types of boat is running your route. Boat service may be suspended during adverse weather conditions. Step down into the pirate boat. Where Does This Operate? 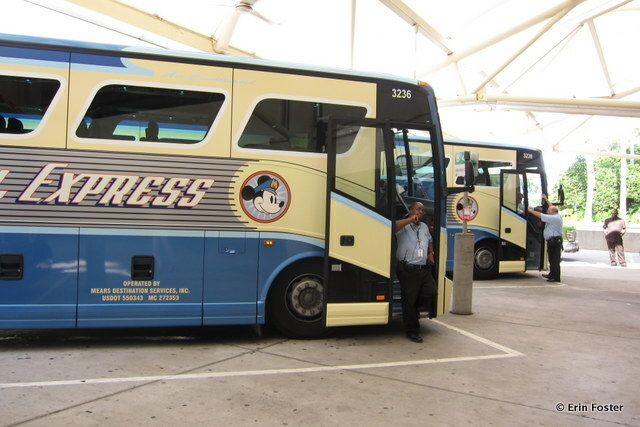 : Magical Express buses run from Orlando International Airport to Disney’s resort hotels. What Are the Hours? : Magical Express runs 24 hours. How Often Does This Run? : Buses depart the airport as they are filled. Waits are generally no more than about 20 minutes. What Is the Seating Like? : Two by seating in plush seats with armrests. Is this Wheelchair/ECV Accessible? 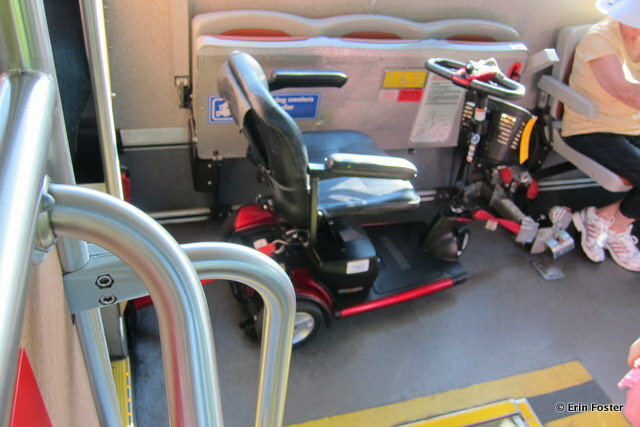 : Mobility devices may be transported on some ME buses. Call ahead to arrange this. What Happens with Strollers? : Strollers must be folded and stored in the luggage compartment under the bus. Are There Alternatives to Using This Form of Transportation? : Take a taxi, town car, or rental car from the airport to your hotel. Any Additional Tips? : Use our guide to Frequently Asked Questions about Disney’s Magical Express for more detailed information. Magical Express buses waiting at Orlando International Airport. 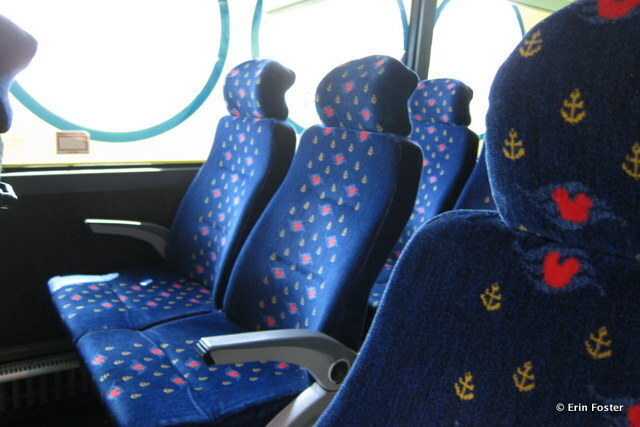 Plush seating on the Magical Express buses. So fellow travelers, tell us about your experiences with Disney transportation. Is there a method you prefer? Have you chosen your resort based on the available transportation options? Have you ever ridden these vehicles for fun rather than for transportation? Let us know in the comments below. 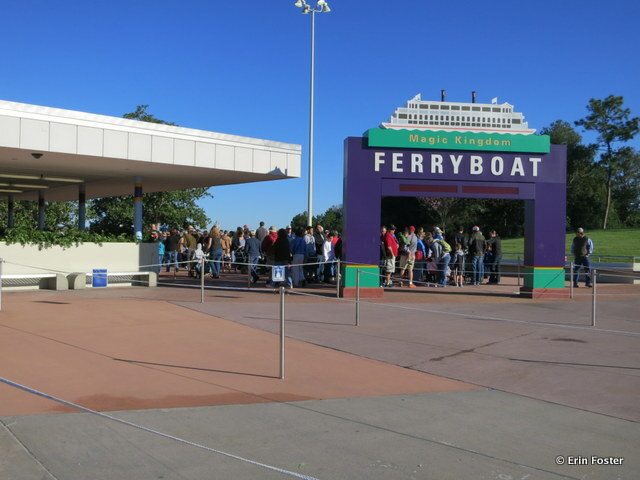 My personal experience as an annual passholder for years is that the ferry boat frequently does not run much before the park opening and is not a reliable option for Early Morning Extra Magic Hours. Depending on the crowds, that can make the wait for the monorail to the Magic Kingdom much longer than you might imagine for that early in the morning. After being disappointed several mornings, we learned to arrive even earlier, or if we are staying on property, to take the buses which bypass the ferry and monorail. Probably my most “magical” memory (out of many) is our first visit to the Magic Kingdom. We chose the ferry — and that sight of the castle in the distance coming into view is one I’ll never forget. You just don’t get that effect by riding the monorail. I have not been on the Magic Kingdom Ferry yet. But have used every other mode of transport. Your blog covers transportation well, but you forgot to mention the single most convenient and fast mode of transportation between parks, cabs! 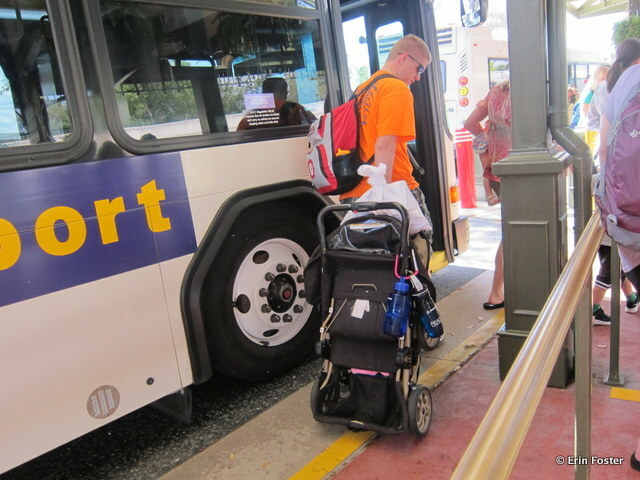 Of course, there is a bus coming to your resort to take you to your destination, but intermediate stops, stroller fold-ups, and long waits can put a big damper on a bus trip. When in doubt and eager to save A LOT of time, take a cab. There are cab stands at all the hotels and parks, and most trips are less than $15. Considering the fact that you jus spent $4 on a diet coke, isn’t it worth it to get back to your pool in 15 minutes? It’s also the best way to get to an early park character breakfast. Hint: you can request a van cab by holding up your hands like the letter A in the “YMCA” song. No need to fold strollers in van cabs and room for 6 passengers. Enjoy! You are absolutely correct about cabs being an important part of the equation. During trips where I don’t rent a car and choose to rely on the Disney transport system, I almost always end up taking several cabs along the way. Particularly when heading from resort to resort. However, my impression is that rates have gone up recently. During a long WDW visit in February 2013, I took two cab rides from the Swan to Bay Lake Tower. Including a modest tip, the rides were $22 and $23 each. Yes, shorter trips will be less money, but these ended up being not insignificant expenses. If you’re planning to take a lot of cabs, then depending on available deals/promotions it might be nearly as cost effective to rent a car. We’re staying at OKW and have a 0745 ADR for Chef Mickey’s (MK opens at 0900), will we be able to get to the Contemporary using the bus, or should I call a cab? Theoretically, there are breakfast character meal buses that head out to the resorts before the regular park buses. I didn’t mention these in the post because I’ve heard such mixed information about the reliability of this form of transport. In your early reservation situation, I would 100% plan to use a cab to get to Chef Mickey’s. Your anxiety about possibly missing your reservation will go WAY down if you know that you’re guaranteed timely transport with a taxi. I’ve never called a cab in America let alone for a resort pick up, so little nervous about that… but not nearly as nervous as I would be about missing my ADR! You won’t need to call the cab yourself. Simply go to the Bell Services Desk located directly in front of the main OKW entrance and ask them to call one for you. You can speak to Bell Services the night before at have them order you a cab to arrive at a specific time. Alternatively, you could arrive at the Bell desk about 10-15 minutes before you want the cab to arrive and ask them to call it for you then. Personally, with a 7:45 Chef Mickey’s reservation, I’d plan to be in the cab at OKW at 7:15. That’s great news about not having to call the cab myself – don’t think my brain works well enough that early in the morning! We’ll have a wander up in plenty of time in the morning then, thanks so much for giving me a guide time. My thoughts/questions are similar to Kitty’s. We want to get to the turnstiles about an hour before opening — just because we are weird that way! Sounds like the boat from WL only runs 1/2 hour before opening time. If we decide to take a cab, where should we have it dump us out? I heard that the T and T Center is where cabs go to the MK. Not very efficient. Would it be better to have the cab take us to the Contemporary? Or will there always be a bus option for early dining? If that is the case, can anyone ride the early breakfast bus? Or would you have to have a reservation number? Again, there are supposed to be early character meal buses, but this not well publicized and sometimes happens and sometimes doesn’t. I would not feel comfortable in telling you to rely on this. If there are character meal buses, anyone can ride them. You won’t need to have a confirmation number or anything like that. The drivers won’t have a list of reservations or any mechanism for checking whether you’re properly headed to a specific destination. I often stay at the WL. You are correct that if you take a cab from the WL to the MK, it will drop you at the TTC, not at the park itself. Your plan to go to the Contemporary is a good one if you don’t mind walking a tiny bit. Have the taxi take you to the Contemporary and then you can just make the 7 minute walk to the MK park gates. Alternatively, you could have the cab drop you at the Grand Floridian and then take the monorail one stop to the MK. Erin, this is really good information. I have done MK early breakfast from the Poly, but not WL. We are staying at WL this year and would not have known that it may not be as easy that early. From the Contemporary, we took the resort monorail to Poly. From Contemporary, one could easily walk to MK, or take the resort monorail to MK. The resort monorail starts at either 6:30 or 7 in the morning. Thus, one can easily use the combo of (WL => boat to Contemporary => walk or monorail to MK) in order to get to MK well in advance of rope drop. Even on an 0800 EMH morning, you could time it so you arrive about an hour before +/- several minutes. This is fantastic information that goes into much more detail than was covered in the books and answered many questions I had. Thanks so much! I know your post focuses on WDW transportation, but I’m curious if you know much about the separate transportation for the Bonnet Creek resorts (will be staying at the Hilton). Anything you can tell me would be most appreciated. I have visited the Bonnet Creek area several times for meals using a rental, but I have yet to stay there, so I can’t specifically comment on their transportation situation. My impression from speaking with other guests who have stayed in the Bonnet Creek area is that having access to a car is a near imperative. However, if you’d like more specifics, I’m sure that the concierge desk at the Hilton would be happy to answer any questions. 407-597-3600. We will have our car and really like to be there EARLY. So for most parks, we’ll just drive. The parking at the Magic Kingdom is more complicated, so we will use a combination of cabs and Disney transport. As I mentioned above, we will probably use a cab for early morning at the MK. (We’ll check the night before to see if there will be an early bus.) On the way back to the lodge for our midday break, we will definitely ride the boat! That is a “just for fun” thing for us! When we return later in the evening, I think we’ll do the boat as well. The bus is sort of fun too, but the boat is special. I have wonderful memories of camping at FW as a kid, and being SO EXCITED to get on that boat and go to the most wonderful place in the world! Thanks for all the great info, Erin! Your articles are incredibly useful! Great blog post – a lot of useful information here! 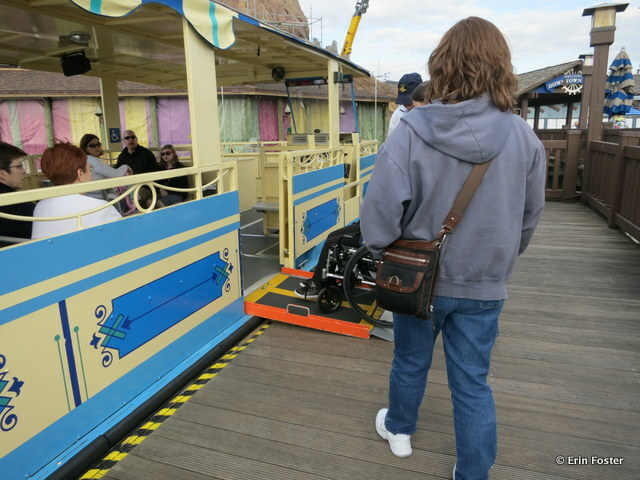 As an aside, Arthur de Wolfe has created a subway-style transportation may of WDW – it is very cool! Oh my goodness, thank you for mentioning this. I had meant to and spaced. I actually purchased a fine art print of this map and now hang it proudly in my Disney-cave home office. Even for this Disney veteran, I often find it to be a helpful resource/reminder. Thanks for this informative post. I had no idea there was so much transportation at WDW. I have a question for anyone that can help me…We are going at the end of August and are staying at on off sight condo. We will be renting a car and parking everyday. How early should we plan to arrive at the parking lot for Magic Kingdom and what do we do from there, just the monorail? We will have prepurchased our tickets. Katerina — Do you have the Unofficial Guide to Disneyworld 2013 edition? It’s my Disney bible! It is incredibly helpful and very fun to read. I don’t remember specifically what it said, but I know there’s a section on this topic. (We’ll be using Disney transportation, so that information didn’t stick in my brain.) I do know you need to allow extra EXTRA time when driving your own car to the MK. 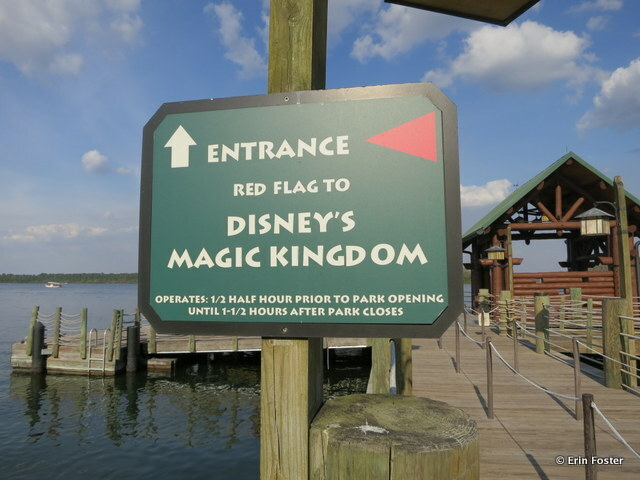 Are you planning to be there early for rope drop? We always go an hour before park opening (but, then again, we are weirdo early birds.) If you have to park your car, then wait for a tram to take you to the Ticket and Transportation Center, THEN wait for monorail or ferry boat, that will take some time. Yes, I am on my second read. I dont know how I ever lived without it. I am a little confused as it did say arrive at the turnstiles 1 hour early, I just dont know when to actually drive into the park, and where to go from there. So when we park, we take a tram and then the monorail? We are a family of 6 with one stroller, so this vacation has to be planned out very carefully. We definitely want to be early birds too and be there an hour before opening. In my opinion, standing at the turnstiles for an hour is really overkill at most times of the year. I typically arrive at the turnstiles about 30-40 minutes prior to park opening and am almost always near the front of the pack getting into the park. I don’t know how far away you’re staying from the MK, so I can’t tell you when to leave. I would consult Google maps and your car GPS system to determine the estimated drive time. Then add about 10-15 minutes for getting through the parking lot toll booth and getting to your parking spot. Once the car is parked, get on the tram to the Transportation and Ticket Center (that’s the only place this tram goes), or if you’re early enough you might be able to bypass the tram and just walk to the TTC. 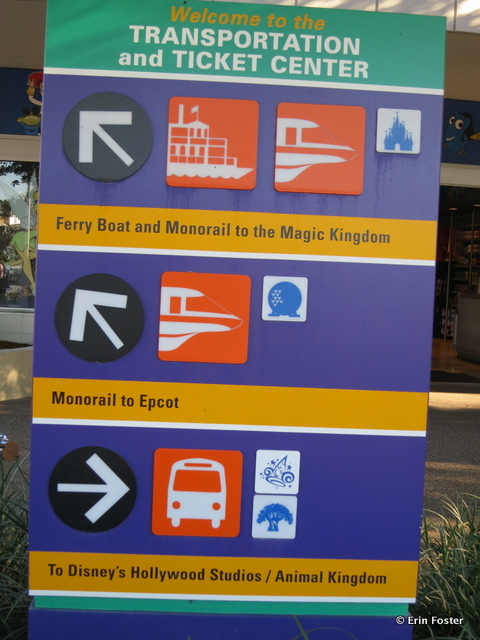 At the TTC you can choose to either take the monorail or ferry to the MK. Both have well marked signage telling you where to go. If you want to be at the turnstiles 45 minutes before the park opens, in August, you should be at the MK toll booth about 75-80 minutes before the park opens. If you were visiting at Christmas, these numbers would be higher. Thank you, Erin. Fun, friendly, factual and ever-so-helpful. Exactly the reasons I came to this site and read the books each year. Thanks for the helpful post. Are cabs typically waiting at the resorts first thing in the morning? We’ll be at the GF and will likely end up taking a cab to arrive at AK and HS by 7:15 for 8:00 park open. Would you suggest we arrange for a cab the night before through the hotel for such an early pick up (considering, too, our need for a van for our family of 5)? Cabs may or may not be waiting in the morning; it’s really luck of the draw. If you’re concerned, you certainly could arrange for a more taxi the night before. Just stop by the Bell Service desk and tell them what you need. In my experience, there are always cabs at GF and Poly, but vans are more 50/50. The same tends to hold true at the parks’ cab stands. The bell men can always call for a van, and it rarely takes more than 5-10 minutes for one to materialize. One tip on those early breakfasts: if you can get a first reservation of the day that gets you into AK or DS well before the park opens, you can eat quickly and be inside the park for the “interior” rope drops which gets you that much closer to Toy Story Mania or Everest! Good luck, and ditto on leaving super early! Hi Erin, Miss you on the Panel!! We will be in WDW in June. What’s the best way to get to DHS from Port Orleans French Quarter. We are planning to, hopefully, catch the last day of Star Wars Weekend on June 9th. I think park opens at 8am and we want to be there in plenty of time. What time should we leave the resort? I’m a little leary of a cab this time. In December we had a cab take us from Contemporay to AKL and it was $30. That seems awfully high to me! I think he may have taken the long way there. I’m not opposed to taking a cab again, I guess I just need to be more aware of our route. Thanks so much. That $30 fare seems high to me as well. The general rule of thumb for years was that you could go between nearly any two points at WDW for a maximum $20 fare. But as I mentioned in an earlier comment, I too have been noticing higher cab bills recently. That being said, unless you have access to your own car, the only options for getting from POFQ to DHS are the WDW bus or a cab. If the park opens at 8:00, the buses should start running at 7:00. If you’re at the bus stop at 7:00, then you should get to the park well before opening. But given that you’re talking Star Wars Weekend, with potentially many special events taking place (merchandise sales, signings), even a 7:30 arrival might not put you at the front of the pack. If you’re just going to enjoy the park/rides/etc., then take the bus. If you’re going for some particular event (I haven’t seen the schedule yet), then you might still be better off with a cab leaving earlier. Good luck! Similar question that has been asked a couple of times, but mine is a little different…we are arriving May 26th and staying at Port Orleans-Riverside. My wife and daughter have an 8:05am reservation for Cinderella’s Royal Table. We will have a rental car that day. So I’m guessing I can take them to the TTC and they can ride the monorail from their to the gate of MK. BUT, everything I’ve read says the monorail starts running an hour before park open. The park opens at 9am, so it would appear the monorail starts at 8am, but that would mean they would miss their reservation. Will it run sooner? Does anyone have any experience with such an early reservation in MK? Taking a cab is not an option because they will only take them to the TTC, correct? Any insight is appreciated! I’m sure there’s a solution. Hi…I bet you can get them to the contemporary (or don’t even pull in the driveway there) where they can walk. Bring your breakfast confirmation number in case you need to make a case. You might call Disney dining back and ask their counsel too. Good luck! 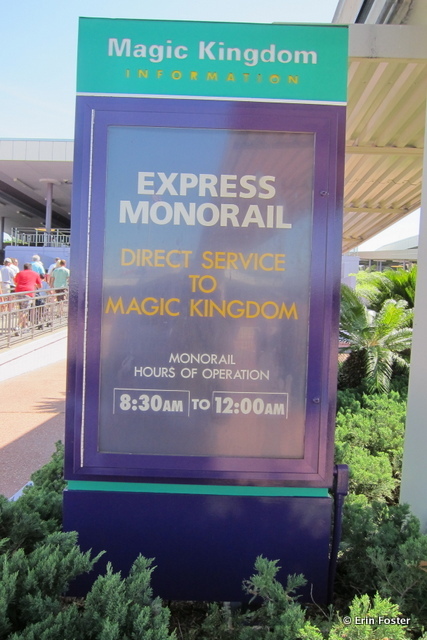 As noted in the post, there are two monorail lines serving the magic kingdom area. The resort line, which does stop at the park, starts operating at 6:30 a.m., primarily to accommodate guests who have early breakfast reservations. Park at the TTC, then take the resort line monorail to the MK and you won’t have any problem. You could also try parking at the Contemporary or GF, but you’d have to move your car after your meal and that would be a big time waster. Thanks for the tips! I did miss the 6:30 start for the resort monorail so that should do us. But I hadn’t even thought about being able to drop them off at the Contemporary as a last option, appreciate the help! Can you please tell me exactly how to get to the Gold flag motor launch? We have booked a wonderland teaparty on a MK day, and was thinking this could be the fasted way to get there. But that will depend on how hard it is to get to this dock and where it is… Any help would be very appreciated! The dock is extremely easy to get to. It is directly in front of the Magic Kingdom park entrance. If you exit the park, you’re facing the water. As you face the water, the gold dock is the one furthest to the right (closest to the monorail entrance). Really, it’s just step away from the park and not at all difficult to find. I decided to make reservations at Kona Cafe for Breakfast at 7:30 a.m. on MK Day but am staying at POFQ and realized I had transportation considerations. I pretty much ruled out the resort bus to the TTC. So, here’s what I’m thinking: You guys say that the TTC typically opens two hours before MK opening. MK opens at 9am on that particular day, so I figured I would drive to the TTC at 7 then walk over to the Poly for breakfast at Kona. Then monorail or ferry to MK for the day. Obviously, pick up car in the evening when done. The sticking point is that I’m thinking of using EMH at Epcot from 9-11. But can’t take monorail because that would leave car stranded. Would there be enough time to drive from TTC to Epcot parking in the evening? Other thoughts? 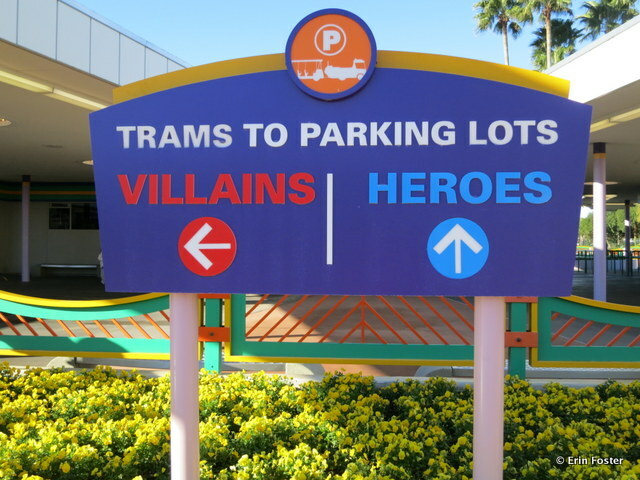 I will have a car, so I am wondering what the best place to park when going into the parks, especially MK. I will have a double stroller for my two young granddaughters. We have 2 early morning character meals, one at Epcot 8:05 and the other at Chef Mickey’s 7:45. Any suggestions or recommendations appreciated. We are going 7/14-7/21. Does anyone know if there is a way to get the transportation schedule brochure before arriving at WDW? I would like to try to plan my schedule before we even leave home. There is no transportation schedule brochure. The timing of the transportation is quite variable and changes on a day-to-day, hour-to-hour basis. The post notes the usual intervals of arrival – monorails come about every five minutes, buses come about every 20 minutes, etc. You all seem like the people to ask. I’m attending a conference at the Swan/Dolphin, but I’m staying at the All-Star Movies Resort. What is my best method of transportation to get from my resort to the swan. The guy at Disney implied to me I could ride the bus to Epcot then find another way to the Swan? Reading through these I seem to think I could go from the Movies Resort to Epcot then ride a boat to the Swan??? 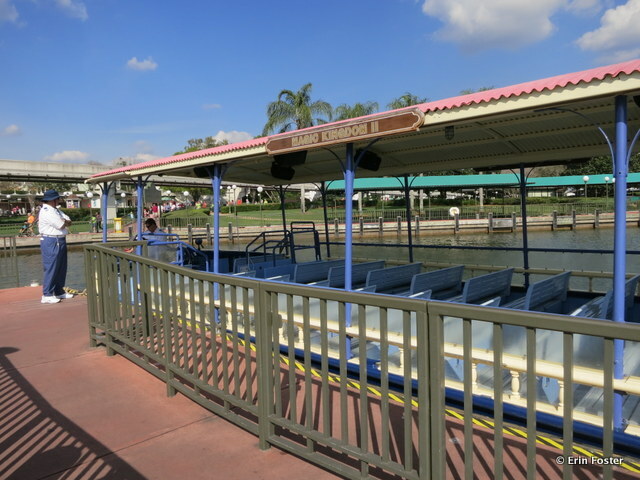 You can take the Disney bus from All-Star to DISNEY HOLLYWOOD STUDIOS, and there is a dock there for a boat that will take you to the Swan/Dolphin. Give yourself plenty of time though! If you take the bus to Epcot, you would have to go through epcot and out the back at the world showcase area between U.K. and France. I think it would be easier to go to DHS and boat to Swan. But just be sure to give yourself PLENTY of transit time. I second the advice to take a bus to Hollywood Studios rather than Epcot. From the front of Epcot, to get to the boat to the Swan, you’d have to walk all the way through the park (using an admission ticket) and then get the boat. 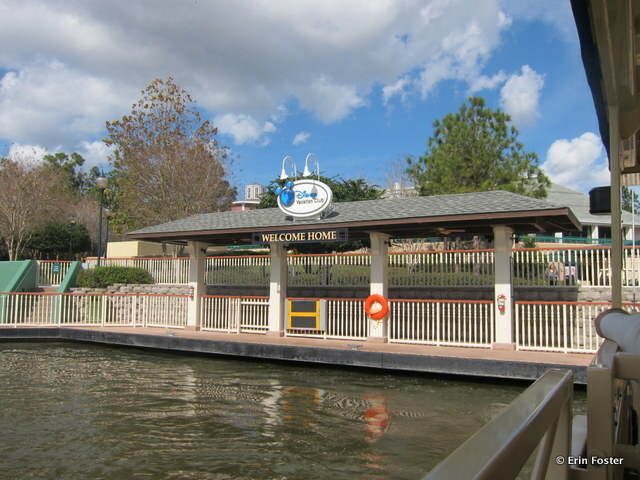 At DHS, the boat dock is outside the park. Or you could easily walk to the Swan from DHS. However, if your conference starts early in the morning, your best bet might be to take a cab. I found this interesting blog about expanding the monorail, I think the author makes some great points. I am hoping someone can shed some light on the outside hotel bus system. It says from my hotel that it drops off at the charter bus stop? I can’t find any info or diagram which shows where this stop is. Is this at the transportation hub with everyone else or is there a separate area for charter buses? Any help would be greatly appreciated. Thank you. Where you’ll get dropped off depends on your hotel. There is a large charter bus area at the Transportation and Ticket Center. You may want to call your hotel to ask whether their shuttle stops only at the TTC or at the other theme parks as well. Thank you for the information. The hotel has separate buses that go to the other theme parks, I just wasn’t sure whether the charter drop off was the same place as the TTC. You’ve helped confirm that for me so thank you. Thanks for all the info! I’m still unsure of which transportation to use for our trip though. We’re headed to Disney in February. This is my family’s 1st time to Disney (for all of us!). We are a family of 4 with 1 stroller. We are staying at All Star Movies and want to arrive at MK for rope drop. (I too, am an anxious early bird so I want to leave ample time for this.) We’re on a strict budget so taxi’s are out. We will have our own vehicle there so should we drive that to the MK parking lot and take the monorail or should we take the resort bus to MK? (Am I understanding correctly that the resort buses go directly to MK, skipping the need for monorail or boat,or am I incorrect?) I’m stressing about having to unload and fold up the stroller while keeping an eye on our toddler for the bus…Thanks! Ben has given you a great answer below. Like him, I’d take your car to the transportation and ticket center and then ride the monorail to the Magic Kingdom. You are correct that the buses do go directly to the front of the MK rather than stopping at the Transportation and Ticket Center, but it sounds like the stress of waiting for that early morning bus would be pretty intense for you. I completely understand your concern as it’s similar to my post from March above! I was taking the family to Disney in May, and it was my first time back in 20 years and first as a parent. We had a stroller as well. My wife and daughter had an 8:05am reservation for Cinderella’s Royal Table but MK did not open until 9am, so I asked a similar question. Per Erin Foster’s response to me, the Resort Monorail starts running early, my understanding is mainly to accommodate early reservations. Since you have your own car, I highly recommend you drive yourself. That early you will get front row or nearly front row parking at the TTC, and it will be free as you are staying in a Disney hotel. You can then walk across the street hop on the monorail and get to the gate in plenty of time for rope drop. 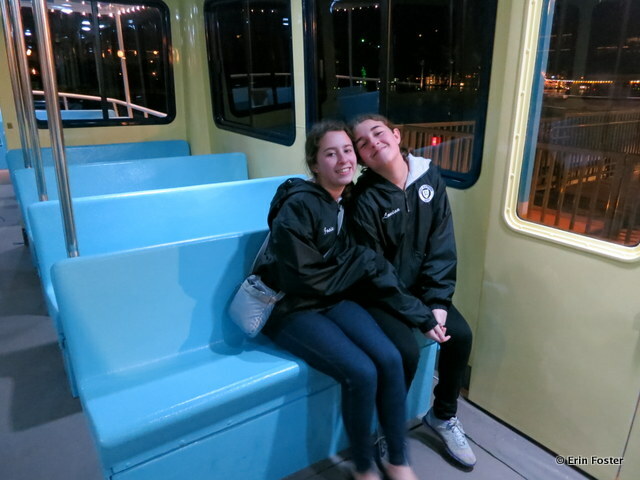 Besides, riding the monorail is a blast, and that time of day we had the car to ourselves. My 2 boys and I were not a part of the CRT reservation but we just “happened” to go to the entry point to the park with my wife as she showed the CM her reservation and they waived all 5 of us through so we didn’t argue! The ladies went to breakfast and the boys and I had nearly an hour of peaceful exploration of Main St and the hub where we got great pictures of everything with no people in the way. We rode the old car just for fun, picked up our first time buttons and then were at Adventureland for rope drop where the boys got their pictures with the pirate flag carried by the CMs at rope drop. A GREAT time to get into the park. Also, we followed the Unofficial Guide’s recommendation of taking a break in the afternoon so the kids can rest and decompress a bit before heading back into the park for the evening festivities (highly recommend this as well!). Because we had driven, and gotten there early, we were able to get quickly back to our car as it was in the front of the MK parking lot and head back to the hotel (POR) for a few hours. The best part was upon our return, we just helped ourselves to driving back to the front of the parking lot even though the lot was “full” and most others were parking in the outer areas. We figured maybe our spot in the front is still open since the CMs had been directing people further and further back all day. Upon our return at about 4:30 we found a spot right up by the TTC again (not original spot, but still front row). No waiting on trams for us (including at close when we left)! Leave early, drive your car, catch the Resort monorail and you’ll be good. No stressing on the bus with the stroller (something my wife also wanted to avoid), front row (or nearly) parking, a monorail car to yourselves, and the fun of rope drop! Thanks Ben & Erin! I was so hoping you would recommend driving our vehicle 😉 Just wasn’t sure if I was missing something that would make using the WDW transportation easier! MK is open until 11:00 the night we are there. We have ADR at Be Our Guest at 8:45. We will be out of MK in time to still catch the monorail back to our vehicle, correct? The monorail will continue to run at least an hour after closing so you’ll have plenty of time to enjoy your dinner and get back to your car. I wouldn’t stress that at all. Glad to help, I researched the snot out of our trip and wanted everything planned as much as possible so we could maximize fun and avoid stress, and these comments and other forums helped tremendously so I definitely want to pass on my experiences. Getting these types of questions answered ahead of time helped put things together and made the trip much smoother. A little unrelated, if you haven’t already, get the Unofficial Guide to WDW with Kids. Absolutely worth it! Also, get the subscription to Touringplans.com so you can set up their custom touring plans. Worked unbelievably well! We never waited more than 15 minutes in any line using the plan (last week in May). My wife was on board with using the plan and we made it kind of a game to get to each ride and see how long the line was, plus the kids (4, 6, 9) never felt bored because we didn’t have long waits. At the same time our trip didn’t feel too “regimented.” We also used TouringPlans.com crowd info to plan which park for which day of our trip to avoid crowds, again worth it. Have fun! Ashley, Ben is again correct. If the park closes at 11:00 p.m., then the monorail will continue to run to the TTC until at least midnight, and perhaps even longer if a number of guests still need transportation. Your dinner at Be Our Guest will likely be over at 10:15 at the very latest, so you’ll have plenty of time to get “home.” One word of advice – Given the day you’re planning (up before rope drop, very late dinner), you may want to plan a light schedule for the next day. You are going to be TIRED. And Ben, Thanks for being such a great advocate for Touring Plans and the Unofficial Guide! We’re glad you had such a good experience. We are staying at the Animal Kingdom Lodge and we will be using the bus to get everywhere, but I had a thought…When we leave Magic Kingdom at night, should we wait for the bus or take the Monorail to the TTC or Epcot and THEN take the bus? THANKS! Personally, I’d just wait for the bus at the MK. You may have a wait, or rather you will have a wait, but it will be just one wait. If you decide to go to the TTC, you’ll have to wait for the monorail and then wait again for a bus. Adding more variable to the mix is rarely a good idea. As for going to Epcot, I don’t see much logic in that. Again, you’ll have to wait multiple times, and depending on what time the park closes you may encounter crowds there as well. Just pack your patience and you’ll be fine. You are excellent! Thank you! What do you suggest as the fastest route from Wilderness Lodge to Grand Floridian? We have a 5 pm reservation at Whispering Canyon then a reservation for a private fireworks cruise at 7 pm at the MK. What about WL to Contemp? This is for next week January 25th. Wilderness Lodge to the Contemporary is super easy. There is a boat route that runs between the two. Just go to the boat dock at the WL. I was there about a week ago. 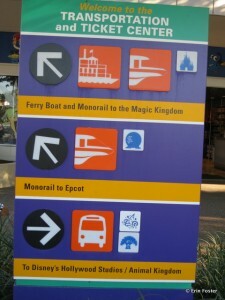 The signage is good, just hop on the boat to the Contemporary. If I’m reading your question correctly, it looks like you’re starting at the GF. You could jus take a cab to the WL. That will actually be the fastest way. Otherwise take the monorail to the MK and then get on the boat to the WL. Hi, Erin! This is a great forum and I was at ease about transportation until I read some of these comments! Now I’m wondering if I should plan to change things around. We have an 8am appointment at the Bibbidi Bobbidi Boutique in MK and the park doesn’t open until 9:00 that day. We will be staying at Art of Animation. I was planning on us riding am early bus and boarding around 6:45ish and taking it to TTC for the express monorail. But should I get a taxi instead or could we actually get on a bus that early and maybe bypass the TTC and be dropped off right at MK entrance? I’m just trying to figure out the most efficient way to get there so wearen’t late! Thanks for any insight on this! There should be a bus that runs from AoA to the MK to get you there on time. Note that I used the word “should.” I’ve heard lots of anecdotal evidence that guests have had unduly long waits first thing in the morning. If you do want to take the bus, stop by the concierge desk at AoA the night before your reservation and ask them what time they recommend you get to the stop in the morning. The words you want to use are “early character meal bus” even though your appointment is at the BBB. I don’t love the uncertainly of the situation you’re in, so I personally would take a cab. If you want to do this, have the cab drop you at either the Contemporary (where you can take a 7ish minute walk to the MK) or the Grand Floridian (where you can take a 5ish minute ride to the MK). Both of these will be faster than getting dropped at the TTC. If you take a cab, you’re basically paying $15 or so for a bit of peace of mind. You have to decide whether this is worth it to you. This March we will be staying at Port Orleans Riverside and have a 3:30 pm reservation at T-Rex the same day we are planning to spend a half day at Animal Kingdom. Is the best way to get from AK to DTD to go back to POR/POFQ and take the boat? What is the best way to get home to the bay lake towers after luminations is over? What is the best way to get between animal kingdom & Epcot? What is the best way to get home to bay lake towers after the fantastic show? These are all pretty easy. To get from Epcot (Illuminations) to Bay Lake, take the monorail from Epcot to the Transportation and Ticket Center, then transfer to the resort line monorail to the Contemporary. There is a bus that runs between Epcot and Animal Kingdom. To get from Disney’s Hollywood Studios (Fantasmic) to Bay Lake, take the bus from DHS to the Contemporary. hi Erin, so glad i found this post. weve always visited disney with unofficial guide since 80s, wouldnt dream of going without it. this is first yr ive used personalized touring plans. traveling with toddlers first time in yrs (4th generation soon to be mouseketeers) – and also concerned re new fastpass. the plans i know will be terrific, can already see that from the printouts. im being more than usually uber prepared, ha ha. but i know it will be a good thing in the long run. but here is my transportation question. 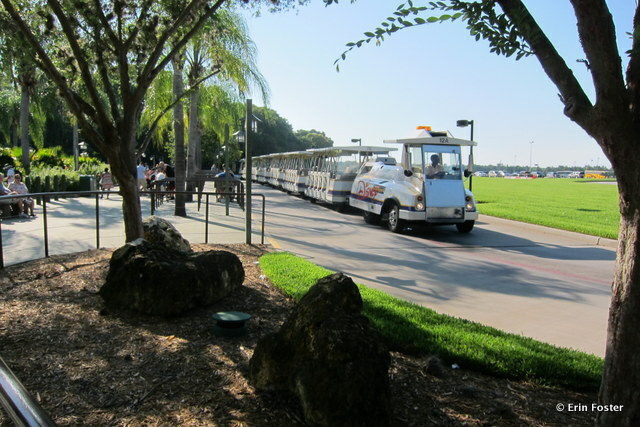 in my blogging travels, i am hearing that the buses from disney hotels can be crowded. we have used autos on all trips since the early ones. opting this yr to use disney’s transport, staying at dolphin. i am hearing on a few posts that buses can get crowded with standing room only, or even having to wait for next bus along. we are early birds always at disney. my plan is to get magic kingdom and animal kingdom buses, first one leaving at 1 hour before park opening. hoping many people wont want to leave as early? 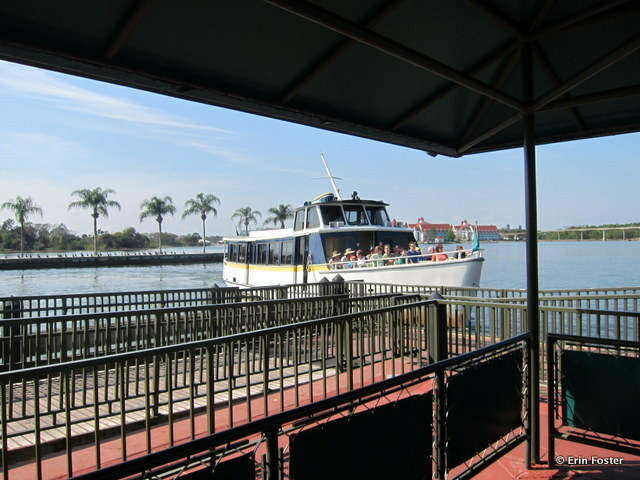 as you probably know, the epcot area bus stops first at boardwalk, then beach and yacht, then swan – we are last stop! so what do you think re my earliest bus of the day scheme? i want to be sure my little guys have as easy a time traveling as can be.